Consider this your local front porch, coffee shop, barber shop, and nail salon combined. Rest yourself and﻿ enjoy all sorts of lo﻿cal ﻿info﻿rmation and news stories. Ladera Heights, Baldwin Hills, View Park, Fox Hills, Culver City, Westchester, Playa Vista ... come on in, enjoy the view. Have something to offer? We need to hear your voice. Step right up and share – send us your story ideas, local activities, recipes, gardening tips, or favorite hang-outs. and how some of our neighbors have already taken action. 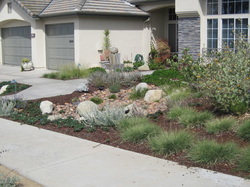 Drought, water, and lawns are on neighbors’ minds, as California gears up for its first mandatory water restrictions. 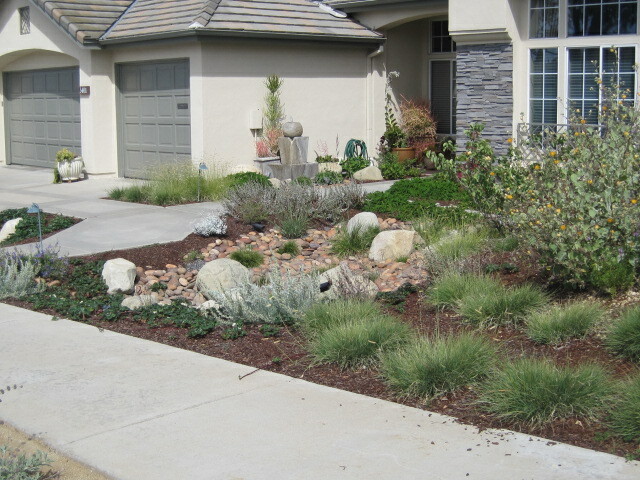 The choices are many: regular grass, artificial grass, painted grass, no grass, or native plants. Ladera Heights residents Nancy and Arthur Day made their decision and took action over a year ago. 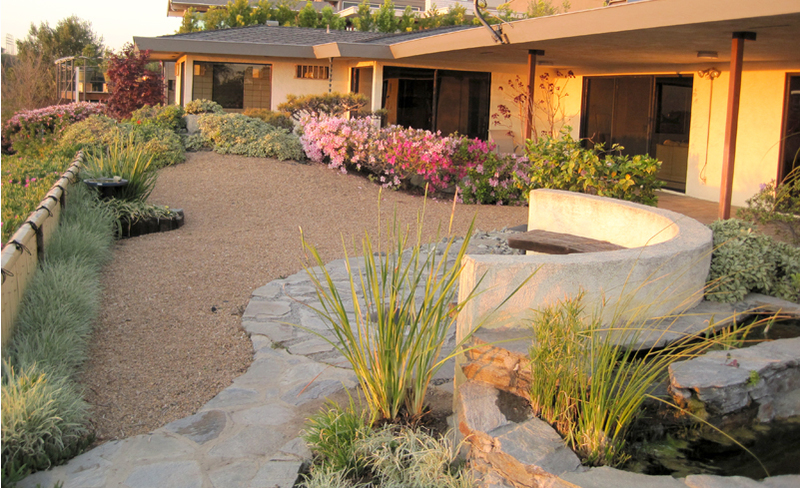 Nancy converted her front and back yards to beautiful native California plantings, designed by Tom Rau, ASLA, featuring a variety of colors and shape. 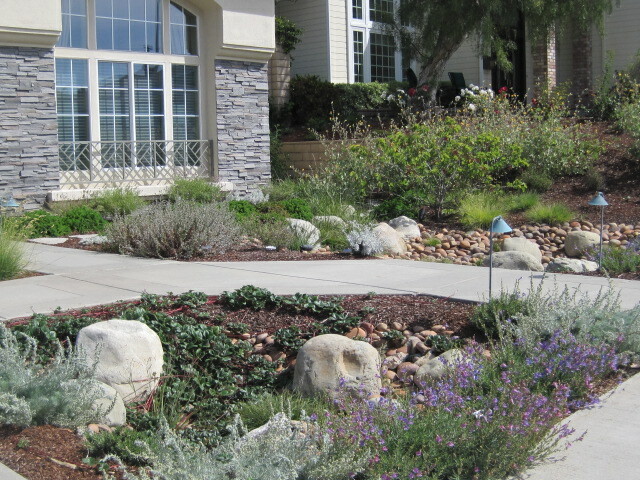 Her switch from grass to native plantings resulted in a monthly water reduction of 70 percent. 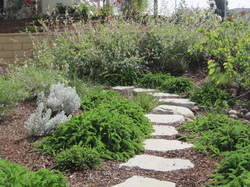 “What I love about the native plants is the variety available to choose from,” Nancy explained. “There are more than 31 different California natives in my garden and each plant has unique characteristics that are beautiful. 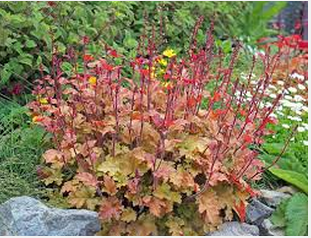 The Heuchera blooms are attached to long stalks that last a very long time. 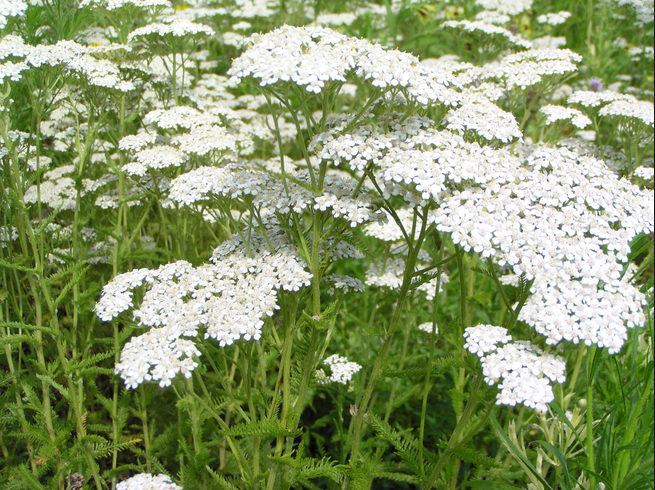 A California Native Seed Store Opens During an Ongoing Drought. The Lack of Water Helps William Mulholland's Career Blossom. 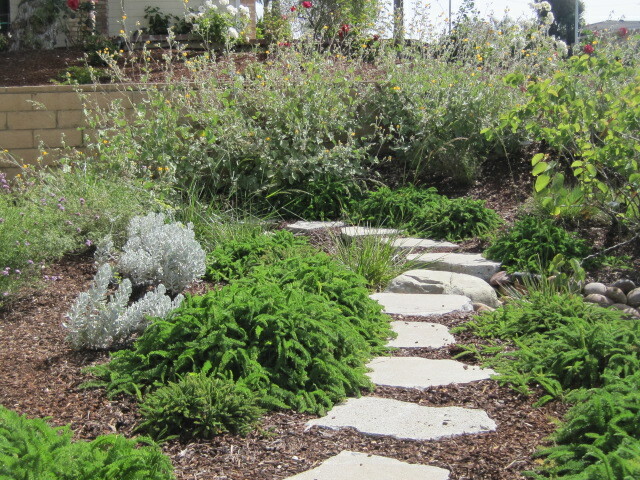 The Days' beautiful Ladera Heights native planting gardens were featured on this year's Theodore Payne Native Plant Garden Tour. 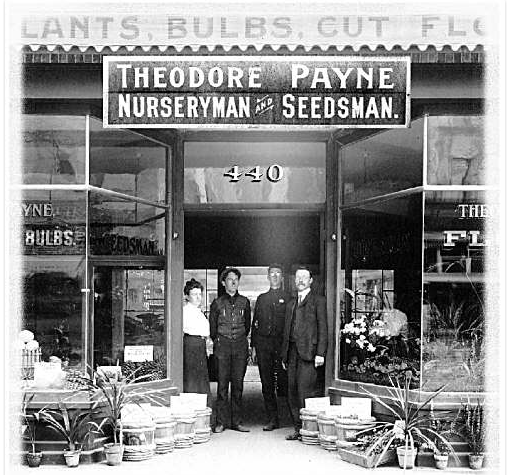 Theodore Payne was an English horticulturist who opened a downtown Broadway store in 1903 offering native California seeds, among a wide array of bulbs, shrubs, and other plants. 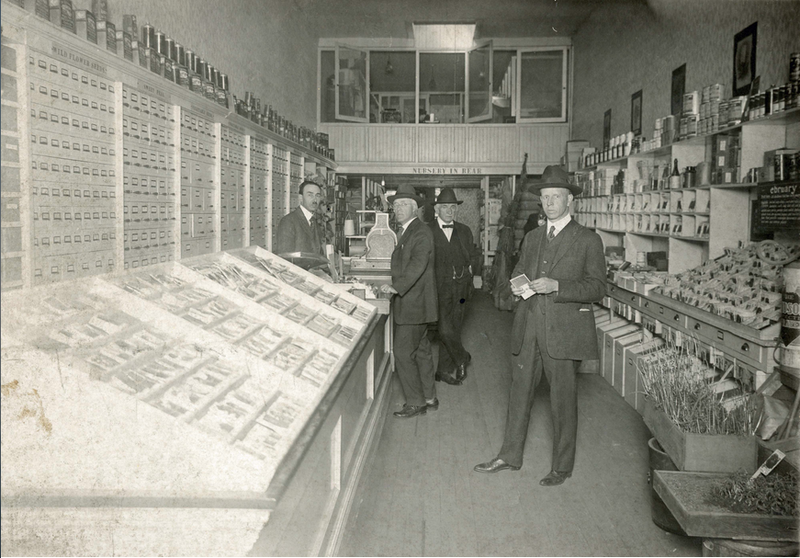 When Payne opened his store’s door, the city’s booming population had jumped from 5,728 to 103,000, in just 30 years. Just one year later, the population reportedly had reached 200,000. 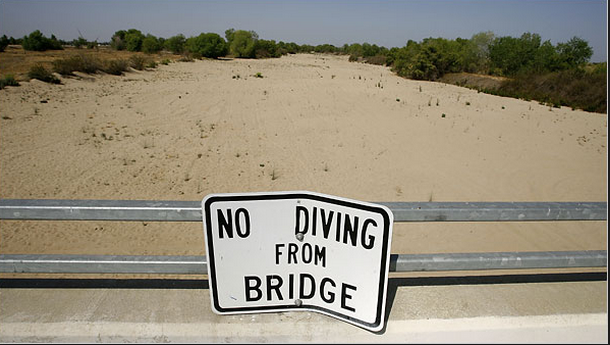 The 5-year drought did not let up as the population kept increasing. Payne found a ready market for his native California seeds that blossomed into flowering plants with only a fraction of the water needed by other popular flora. 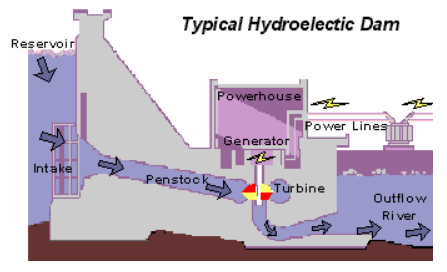 "Water is the cheapest source to generate electric power." Nancy Day, the former president of Water and Power Associates, Inc., toured California’s vast water infrastructure as part of her job. She knows the problems and challenges well of keeping Los Angeles supplied with water. Our Water Supply: What Does the Future Hold? One of our many water starved reservoirs. Greywater systems, recycling dish and shower water for plant irrigation, are growing in popularity. Desalination is a hotly debated topic due to potential aquatic ecosystem challenges, the high construction costs, and the elevated energy consumption. On the other hand, the process is in use or under construction in 25 countries, including the United States. Florida has multiple desalination plants. 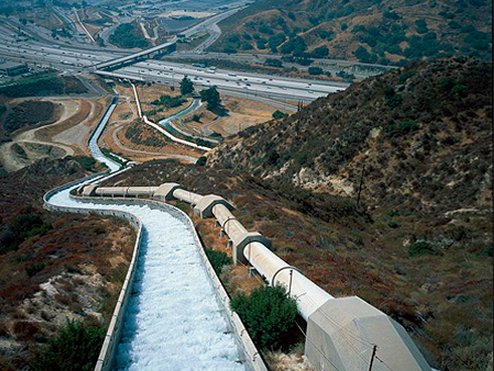 A $1 billion Carlsbad, California desalination facility is scheduled to provide drinking water to San Diego by 2016. Sizable rebates are being offered on a wide variety of water saving devices through our local water company, California American Water. Go to www.amwater.com. Select your state at the upper right and then click on Conservation and Rebates. 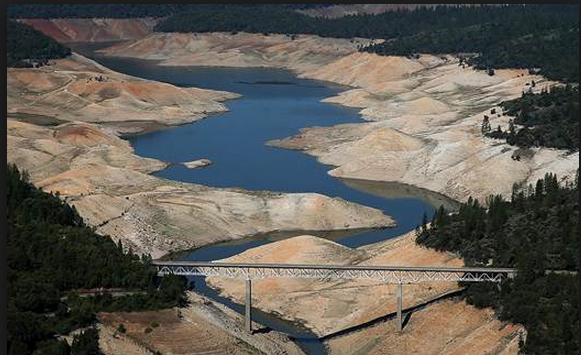 We are in our fifth year of one of the most serious droughts on record. It is time to cast aside a complacent “Not my problem” philosophy regarding the diminishing water supply and take action to implement change. Let us all become proactive and help make a difference. 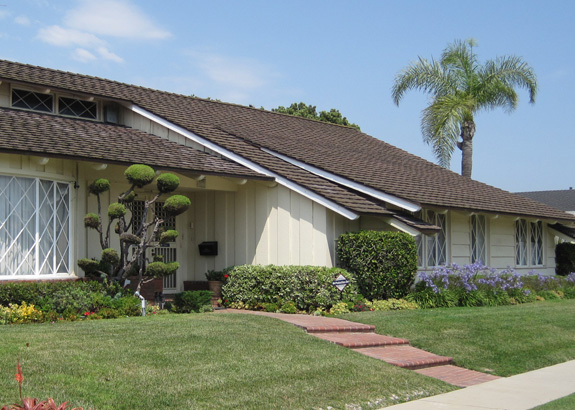 Looking at L.A.'s many pre-WWII neighborhoods, it's easy to forget that many of them were created as pre-planned subdivisions, as manufactured as today's much-maligned suburban gated communities. We'd like to think of old charming blocks of bungalows and small businesses as having grown organically, with each new phase of development based on the notion of supply and demand, but most often than not, they have been results of careful planning. 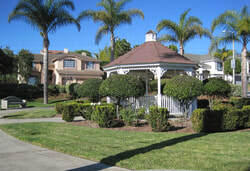 The South L.A. neighborhood of Leimert Park is known for its modest, well-kept Spanish-style homes and eclectic businesses centered around Degnan Boulevard, which, as the Leimert Park Village, has carved out an identity over the past several decades as the center of African American arts, culture and identity. This relatively recent development can indeed be attributed to an organic growth, resulting from a variety of historical events, from WWII, the growth of suburbia, Watts uprising of 1965, or the L.A. Riots of 1992. The 230-acre neighborhood had its genesis as one of the first master planned communities in Los Angeles -- the vision of a shrewd, prolific developer named Walter H. Leimert. By this time Walter H. Leimert had moved his family and base operations to Los Angeles, and had begun developing projects in the southland. After developing Bellhurst Park in Glendale, Leimert saw potential in the areas east of the L.A. River, speculating that the planned building of six major bridges would provide access between the rapidly over-crowding Westside and the untapped frontierland of the Eastside. 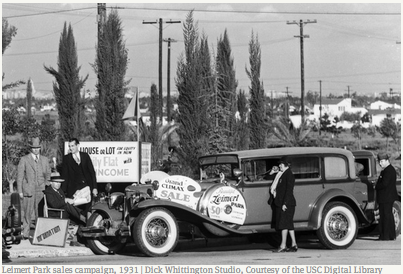 How You Can "Live in the Park"
In 1927, in one of the biggest land transfers in Los Angeles at the time, Walter H. Leimert purchased 231 acres of land from Clara Baldwin Stocker, the daughter of the colorful land baron Elias "Lucky" Baldwin. The purchase was made after Leimert had surveyed the area and found that "only twenty-six vacant homes were found in more than eighty square blocks." This property, part of Baldwin's Rancho La Cienega -- once one of the most profitable dairy farms of the region -- was bounded by Santa Barbara Avenue (later Martin Luther King, Jr. Boulevard) to the north, Arlington Avenue to the east, Vernon Avenue to the south, and Angeles Mesa Drive (later Crenshaw Boulevard) to the west. 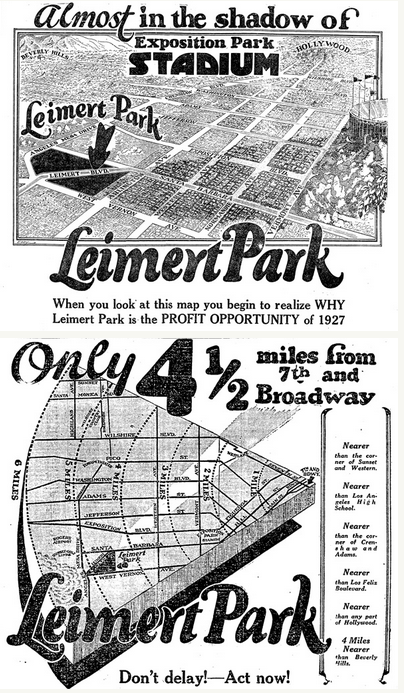 This became the blank canvas onto which Leimert would paint his vision for the perfect planned community. Leimert, as the self-appointed "recognized expert on city development," assured potential buyers that "while development stood still out to the eastward, PRICES ALSO STOOD STILL. You can buy now at 1914 prices." 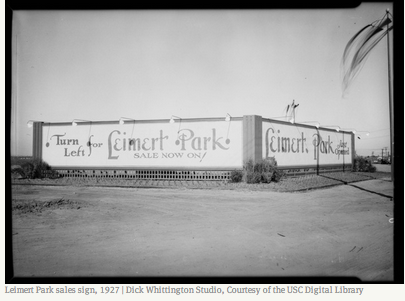 Read Yosuke Kitazawa's complete, fascinating photo-feature on the history of Leimert Park here. Watch a video segment based on this story produced for KCET's award-winning TV show "SoCal Connected. Ladera Heights 3 bedrooms, 2 baths $25,500! 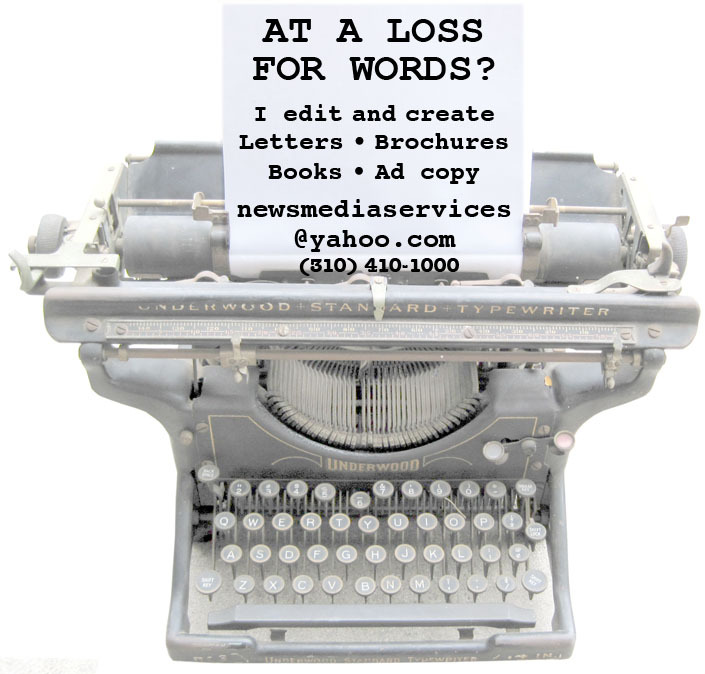 Photo should not be reproduced for commercial and/or business use without permission. Did we mention that this photo dates to the 1950s? Look at the signboard on the right side of the picture for the latest hot Ladera deal. 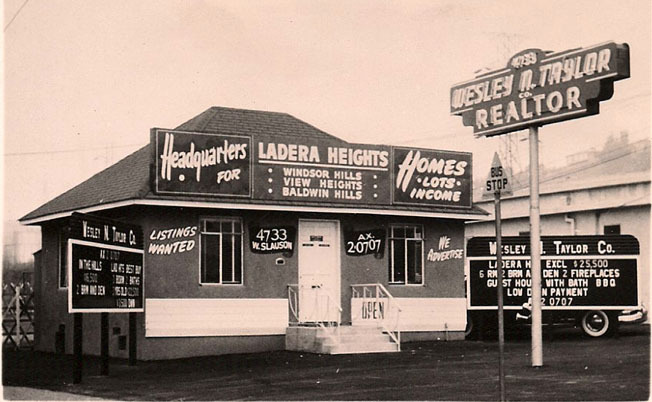 The homes probably were being sold in what is now called "Old Ladera", which was developed before Ladera Heights. Note realtor Wesley Taylor's other key geographic areas of business. Windsor Hills, View Heights (later View Park), and Baldwin Hills were developed many years before Ladera Heights. during a February 20, 1958 flood at Sepulveda Boulevard and Centinela. please email them to info@laderaheightsnews.com). Diamond-shaped window panes, exposed rafter tails, and curved dining room windows are a few of the elegant touches of a Valentine home. This is one man's success from scratch story. Thomas A. Greene put his natural art and design skills to work when he learned advanced dental prosthetic skills at the UCLA School of Dentistry. He honed his talents at the U.S. Army's busy central dental laboratory during the Korean conflict. He later opened a successful dental laboratory, fulfilling orders for a majority of Los Angeles dentists. He proudly noted his father had graduated from the USC School of Dentistry in the early 1920s, an accomplishment that few people of color could claim at the time. While he enjoyed the success of his dental laboratory, the artist within him needed more creative outlets for his skill in molding gold. He had a talent for drawing since he was a boy. He sketched out original jewelry designs and transformed them into beautiful gold necklaces, bracelets, and rings, using the same tools found in his dental lab. Click to read more. Talk about living through a lifetime of changes. 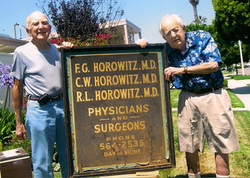 Doctors Bill and Bob Horowitz are respectively 95 year old and 94 year old Ladera Heights residents who grew up in Watts. They went on to have a six decade Watts medical practice, together with their late, older brother, Fred. They practiced medicine through historic times, spanning World War II to the first few years of the 21st century. Dr. Bill and Dr. Bob live only a few blocks apart in Ladera. Click to read more. John and Betty Stivers gaze around their Ladera Heights living room, as the warm afternoon sun rolls gently across an array of beautiful built-in cabinets and furniture. 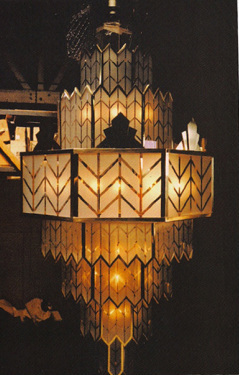 John designed and crafted almost every piece. It took him over two decades. John likes to say, "It took us twenty years to get this house right." Make that twenty years of nights, weekends, and any other free time he had from his job at Hughes Space and Communications. Step by step, one piece of built-in furniture at a time, the interior of their new home turned into the house of Betty's dreams. 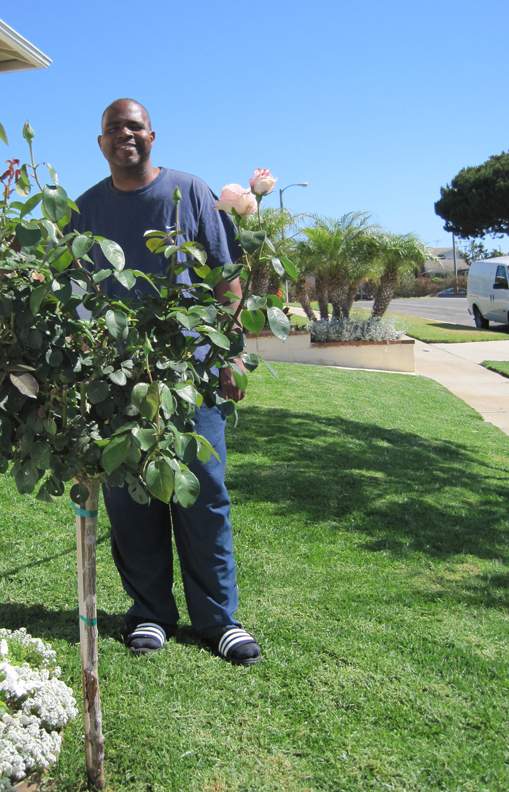 During most any weekend in Ladera Heights, there is at least one man who can inspire you to get you to beautify your lawn. You may spot Russell Redmond on Holt Avenue, just south of Slauson Avenue. He is usually out there mowing, weeding, watering, or fertilizing his green front yard. This is a lawn that knows what love is. We all are particularly fortunate to live in a climate where the warmth of spring heralds the onset of a long growing season of delicious garden fruits and vegetables. A few of us are particularly lucky. There you are, still half asleep, as you open your front door early in the morning to retrieve the newspaper. And what’s that? You blink in the sunlight a few times, trying to process the unexpected sight of a six-pack of young tomato plants sitting there. Click here to read more. 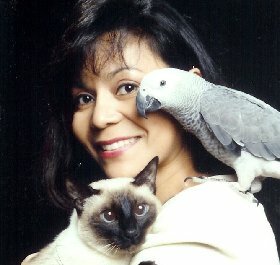 Cheryl Cook is a name many of us in the neighbor- hood know for her voluntary pet rescue work. Thanks to her devoted efforts, scores of residents have been reunited with their lost pets. She posts notices almost weekly about a lost dog, cat, or other pet that she has seen, taken in, nursed back to health, or heard about from other neighbors. Read more. Thirty-five year Ladera Heights resident Hatosha Drumgoole often strolled out to the railing of her terrace with a cup of tea and took in the expansive view overlooking Ladera Park. Watching children playing, people exercising or just seniors relaxing on park benches, she had a vision. The exterior of her lengthy retaining wall would be a perfect place for a large mural that everyone could enjoy. She fortuitously met mural artist Sarah Anthea Podolski through a friend. “We hit it off right away,” Hatosha said. “Sarah showed me pictures of her work. I knew it was a good fit.” Click to read more. James Chitty has the chiseled, handsome looks of a television reporter. He started out in college practicing for that role. He loved the life. "It is amazing how differently things turned out, " he commented, with a smile. The television journalism major graduated from Cal State Long Beach and spent three years at KOCE TV behind the camera as an Associate Producer. Jim landed exciting assignments with the educational television station. He traveled around the world for four months in 1973, helping to produce an anthropology series shown on the BBC and CBS television. The call came in on his Handie Talkie radio, "Squad 58 … eight-month old choking in your area." His laptop computer beeped and a similar message flashed on the screen with directions and vital information. Twenty-six year old Los Angeles County Fire Department firefighter/paramedic Kelvin Patterson and his partner Carl Guillimet, turned on lights and siren and raced to the address. They radioed that paramedics from Station 58 were responding. The powerful Bell 412 rescue helicopter hovered over the high, slick Palos Verdes cliffs. 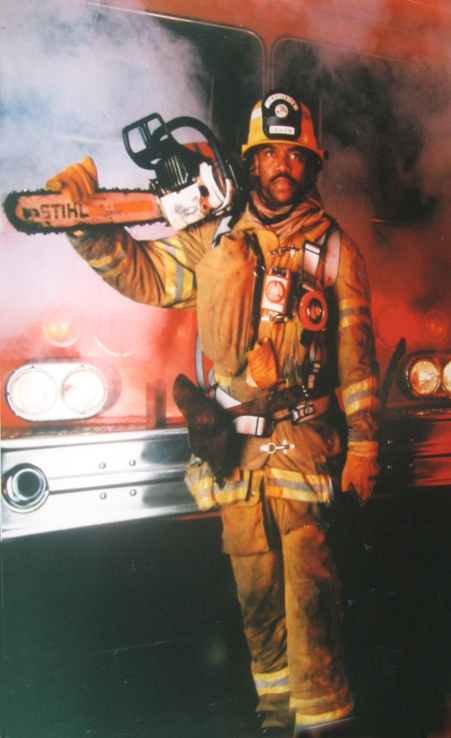 On board was firefighter and paramedic Roosevelt "Rosie" Henderson of Los Angeles County Fire Department Station 58. The chopper pilot tilted the ship slightly, so Rosie could see the heart-stopping scene. A father gripped his young son for dear life high up on the side of the cliffs. They were desperately clinging to a small ledge. Rosie was concerned that one misstep would send the man and boy tumbling down 200 feet to the jagged rocks. An inquiring "Hello" was greeted with silence on entering Danny's Shoe Repair shop in the small Fox Hills Plaza shopping center. It was a warm September afternoon. The sun trickled into the narrow, deep space and was swallowed by the darkness. Thanks ﻿for stop﻿ping by neighbor. The content of this website is the property of laderaheightsnews.com and News Media Services Inc.
and shall not be copied or reprinted for commercial use of any kind without authorization. Thank you for your cooperation. info@laderaheightsnews.com. Ladera Heights news stories, Baldwin Hills, View Park, Windsor Hills, Westchester, Playa Vista, and Culver City.